This Steve McQueen Triumph model is a 1/12 scale replica of the Triumph TR6 Trophy from Christmas movie favourite 'The Great Escape'. 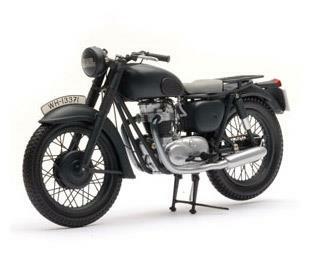 The bike Steve McQueen's character rides in one of the most famous bike scenes of all time should technically have been a wartime BMW, but it was in fact a Triumph TR6 disguised with a military-style paint job, a luggage rack and an old seat. The famous fence-jump stunt was actually performed by McQueen's friend, the legendary stuntman Bud Ekins. McQueen attempted the tricky 60ft leap himself, but crashed out. However McQueen did do alot of the riding himself. He played the part of one of the German persuers in the final chase. He also played the German rider that his character steals the bike from by stringing a wire across the road. 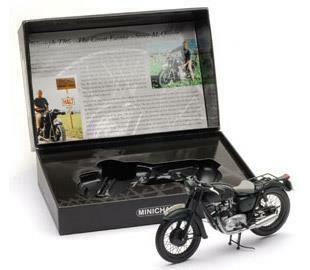 This diecast replica of the bike that stared in those stunts is about 7" in length and comes in its own presentation box. 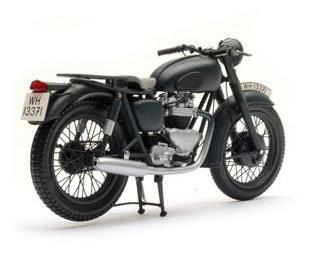 The 1:12 scale model is £63.61 (& p+p) from the MCN Shop.